Though Durango is an important regional city with some 600,000 people, for much of the year visitors from the north and east consider it drive-through territory on their way to the highways of the Pacific Coast and the beaches of Mazatlan (a passage one must earn by braving the stunningly beautiful and equally treacherous Devil's Spine – a seemingly endless winding mountain road that takes you above the clouds and through so many blind turns that first-timers often wear out their breaks). Located on the high plain of the Sierra Madres at an altitude of 1890 meters (6,200 feet), the climate in Durango is rather cold and dry. The year round average temperature is 15°C (or about 59°F) so be prepared for cool to downright cold nights, especially when visiting during the winter months. During the more temperate summer, Durango attracts nearly a million tourists for the month-long "Feria Nacional de Durango," a series of concerts, shows, and other events in celebration of the founding of the town on July 8. Tourists also enjoy visiting the city's several museums, which include the Durango Regional Museum, an archeological museum, two museums of contemporary art, a museum of film, a museum of the Revolution in Durango, a museum of sacred art and an interactive museum for kids. In the beautiful Parque Guadiana, families can enjoy glimpses of local fauna and flora, rides for kids, and other recreational activities. Durango's rich colonial history goes back to Francisco de Ibarra, a Basque explorer, who established the city on July 8, 1563 as the capital of Nueva Vizcaya, a province that encompassed the modern states of Chihuahua and Durango. Durango was originally founded near a tiny village called "Nombre de Dios" which was, for centuries, a mining community. Like many Mexican colonial cities, mining was the heart of the city's economic activity and reason for being. By 1921 the census counted 67,456 inhabitants, interestingly, a third of which were described as "European immigrants." Like virtually all other colonial cities in the north of what was then New Spain, Durango was laid out in the pattern of a rectangular grid of narrow cobblestone streets. The city remained that way until the population boom that took place in the 20th century and, especially, the advent of motor vehicles. Though modernization continues to encroach upon the past, the city has retained much of its colonial charm. Like most colonial towns in Mexico, the architecture of Durango started off as a simple, tile, Mediterranean style, but gave way to French baroque and neo-classical influences in the 19th century as it grew more prosperous. 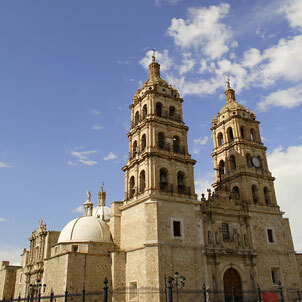 Architectural attractions include the Governor's Palace, the Palacio Municipal, the Casa del Conde de Súchil and the postcard-worthy Catedral Basílica which is regarded as the most important and most spectacular structure in Durango and an exceptionally beautiful execution of Mexican baroque architecture and décor. Though construction of Catedral Basílica commenced as early as 1695, most of the decorative art and flourishes were added in the 19th century. While the city of Durango is not often found at the top of most traveler's list of Mexico tourist destinations, this unique city has some great views, fantastic colonial architecture, a long and rich history, and is certainly worth the attention of visitors who find themselves in the area of this desert gem.